The Mughals ruled India starting from early 16th century till late 18th century before losing to the British. The founding emperor Babur led many brilliant military campaigns against the Indian rulers to consolidate the future of the empire. Driven by the urge to fulfill Timur's legacy, embark on the history's one of the greatest campaign to rule the Indian subcontinent. This scenario is about the first battle of Painpat fought between Delhi Sultanate and the Mughal armies, where being awkwardly outnumbered Mughal forces managed to win by Babur's superior tactics. It was the earliest battle to use the gunpowder firearms and introduced cannons in Indian soil. 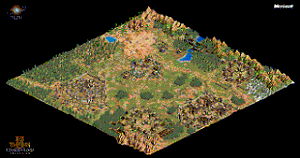 This is my first ever scenario in this great forum that live the game I would say, though I am a horrible AOE2 player but still own only one game which is this one(along with two dlcs from steam). Ever since 2003, when I was first introduced with the computer at the age of 10 this was the game I saw my cousins playing; till then not a single day passed without me playing this game for at least 30 minutes. Countless sleepless nights passed before this scenario was made, and my scenario folder is full with unfinished projects. With bassi helping and encouraging me a lot, this project was successfully finished. bassi was also the only playtester for this game. I would really appreciate if you rate and comment this game. ~ 3 Custom AI with a total of 2000+ lines. ~ Detailed map design with realistic forest, eyecandy and nice geography. ~ Design tricks from the university articles learnt and applied. ~ AI is aggressive and challenging. ~ Compatible with HD version also. ~ Population limit is 150 for this scenario. Additional Comments: A very nice work for the author, who claims it is his first, and also very well done playtesting by bassi, as there wasn't a single bug I would encounter. Recommended download. 'First Battle of Panipat' is the author's first submission, and conveys a rarely discussed historical battle about Babur and his exploits conquering Northern India in the 16th Century. The result of this battle, and of the two following it at later dates, would eventually pave the way for the Mughal Empire's dominance over India for the next two centuries. SUGGESTIONS: It would be useful to give Babur more of a voice in-game as well as that of his nemesis Ibrahim Lodi. Currently as it stands they're both nothing more than computer players on screen without a word spoken. As the victory condition mentions Lodi dying in battle, might it be worth considering including him within the game play as a hero unit? Additional events and dialogue would also give the game play more depth, but it would have to compliment the game play not merely be there for show. Lastly, the jump from standard to moderate difficulty is quite steep, with standard being a comfortable experience and moderate too intensive. It would be worthwhile updating the AI slightly to give the overall difficulty curve here a more balanced approach while providing the toughest experience on hard difficulty. CONCLUSION: 'First Battle of Panipat' is a standard yet well-designed scenario that provides classic B&D game play against the backdrop of a well-conveyed historical subject. This will challenge most with its relentless custom AI, and really should not be passed over. In a sentence - Classic game play that provides an immensely challenging and fun experience. In a word - A highly-recommended download. Thanks a lot guys for your awesome reviews and comments. It's really inspirational for designer at any experience level to get such motivational suggestions to improve their work from so legendary designers. I would really like to implement those in my upcoming scenarios and in the updated version of this scenario. Chandragupt bro, as from Indian subcontinent (Bangladesh to be exact) I think it is our duty to promote our rich culture and history in depth--- be it in a game for fun or so. Thanks for downloading the file and hope you enjoyed it. Don't forget to leave a review. One more thing, have you guys tried on hard difficulty? I think those are hell as many war elephants come to attack your base with gruesome blood-lust!! Looking forward to more reviews and suggestions. The response from the first work really filled my heart, once I learn the trigger works more enjoyable and playable scenarios will come.